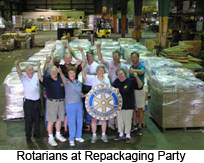 The collection networks are staffed by volunteer Rotarians at the club level. They coordinate the pick-up of books from the donors in their communities. All donations must be boxed and the boxes palletized before they are taken to the Exel warehouse. Large donors such as school districts present a particular challenge for the Rotarians. If the size of the donation is too large to be comfortably transported by a pickup truck with multiple loads then a commercial truck is hired or donated to transport the books to Exel’s warehouse. Clark Freight has donated a lot of free transport over the five years they have been involved with the project. We thank both Exel and Clark Freight for their assistance. For book donation outside the Houston area, we ask the coordinating Rotary club to cover any expense of getting the donated books from the community to Exel’s warehouse. Secondary collection and shipping terminals have been established in Marietta, Georgia; Madison, Wisconsin; Dixon, California; and Dallas, Beaumont, and Abilene, Texas. All secondary terminals except Dixon ship to Exel for combination with other sources of books and educational materials. Each of the secondary terminals operates a collection network like the one described above. When the pallets arrival at Exel, the Exel staff receives, weighs, assigns a tracking number to the pallet, and enters the information in a data base. They have also sorted the Spanish books from the English books for us.